Early Payment Discount, book before your course starts and save £3! (The advertised prices on the website are discounted by £3 and are applicable if you book and pay prior to the start date. 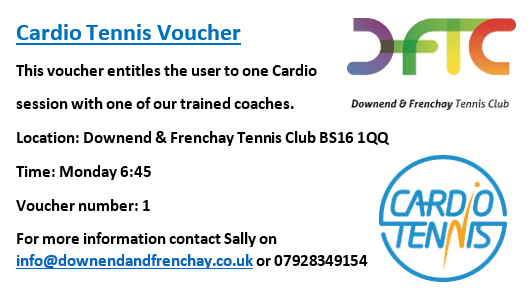 Contact us at info@downendandfrenchay.co.uk to purchase your booklet!! New to Cardio? Take out a trial course of 6 weeks for just £15 – Email us to take up this offer! Cardio Tennis is a high energy fitness activity that combines the best features of the sport of tennis with cardiovascular exercise, delivering the ultimate, full body, calorie burning aerobic workout. It is a very social and fun class for players of all ability levels taught by a tennis teaching professional. If you’ve never played tennis before it is a great way to be introduced to the sport and if you are an experienced high level tennis player it is the best way to train for tennis. Most classes have mixed ability and some facilities offer classes which are more specific to ability/fitness level. However, regardless of ability or fitness level the tennis professional is trained to provide the ultimate workout for each person. It’s social – playing Cardio Tennis with friends doubles the fun. It’s fun and entertaining – with varied exercises and great music, Cardio Tennis will have you and your friends fit, firing and feeling great! It’s energising – you’ll feel great afterwards. It’s results-focused – as it helps women burn 1260 to 2100 kilojoules per hour and men can burn between 2100 to 3360 kilojoules per hour. It’s adaptable – appealing to all abilities and levels of fitness, so you get the most out of it. For more information or a free taster session please contact us.